We just picked up our Nexus 7, Q, and Galaxy Nexus with 4.1 demo devices and will be publishing a piece with some impressions of the Nexus 7 and Android 4.1 shortly. Demoing the Nexus Q however is a bit challenging (and I forgot my remote to unlock the hotel TV HDMI ports), so Google had a demonstration setup of a Nexus Q with paired Nexus 7 tablets and all the functionality exposed. I have to admit I was originally a bit uncertain about what functionality the Nexus Q would deliver and how it fits in with Google TV, but all makes sense now. The device is really an accessory to everything visual and audio under the Google Play umbrella. That means Google Play Music, Movies, YouTube, and so on can be played back through the Nexus Q to an attached TV or A/V Receiver. If you're the visual type, just watch the video and all will be explained. If not, read on. The Nexus Q has outputs on the back for Optical TOSlink, 5.1 audio banana plugs, microHDMI, microUSB, and 10/100 Ethernet. The Nexus Q can again be used either in an audio-only mode as a music sink, or for audio and video. Inside is the same OMAP4460 SoC that's in the Galaxy Nexus, along with 1 GB of RAM, dual band (2.4 and 5 GHz) single spatial stream WiFi, Bluetooth, and NFC. The top portion of the Nexus Q rotates, controlling audio playback volume. Tapping on the center pauses media playback. 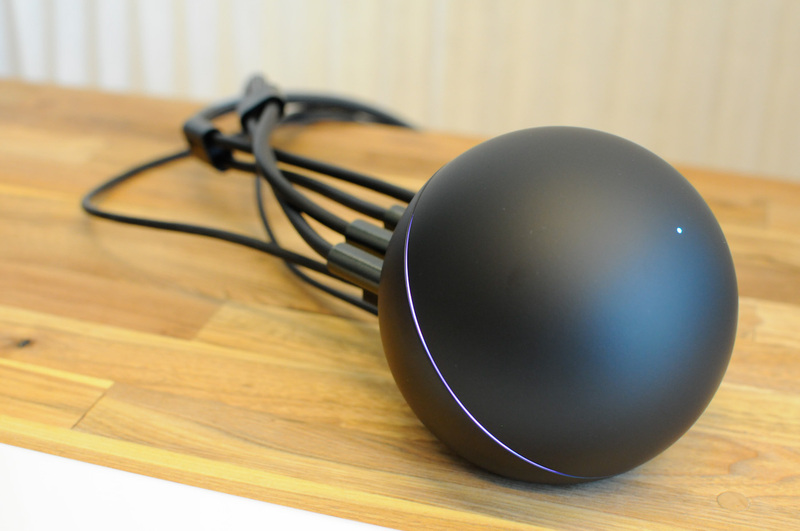 Nexus Q attaches to your WiFi network, and streams music or video in your Play Store account from the cloud. Media gets downloaded directly to the Nexus Q and sits in that 16 GB of storage in a 24 hour cache. There's no file system to manage or worry about, however. Users can tap their NFC-enabled devices to the Nexus Q and download the Nexus Q Settings application, as well as update their installed Play Store applications to be compatible - there's no ICS requirement for client devices, you just need to be able to run the newest Play Store Music and Movies applications. The control application lets you perform initial setup (which happens over Bluetooth), as well as control what outputs are to be used on the Nexus Q for video and audio. 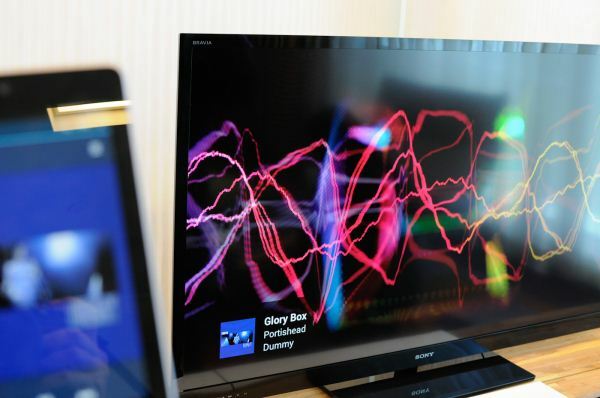 There's also control over the music visualization, LED color theme, and brightness. Multiple Nexus Q endpoints can be setup and will automatically light up with different colors as well as populate drop downs. What's different about Nexus Q from, say, Apple TV, is that media isn't transcoded and sent over to the playback device, but instead played back from the Nexus Q directly. That way, users can leave the WiFi network and media will continue playing back. Friends with purchased media can also playback that content without any setup at all. Multiple clients can attach and add to a queue on the device, adding music that's either in their account or purchased. There's no credential system setup, however, so anyone on your network can change and control the playback queue. To some extent if you're privileged enough to be given a friend's WiFi PSK you probably can be trusted to not maliciously playback indecent YouTube videos or clear the queue, but I still think playback credentials would make sense. There's no current support for playing back content from other sources, like say Netflix. This is really a sink for audio and video from the Android ecosystem at this point, though it seems like adding other streaming functionality is another logical step. During the keynote the presence of microUSB was mentioned for hackability. It's obvious Google envisions the Nexus Q as something of an Apple TV or Airport Express (audio playback) accessory to its media stores. I also asked where the Nexus Q sits compared to Google TV and got the impression Google views the two as largely orthogonal, with no intention to have the Nexus Q replace Google TV, or for Google TV to inherit some of the Nexus Q features (which seems like a logical next step). The rest of the details are pretty basic - the Q supports output at 1080p30 in addition to 720p and other basic resolutions you'd expect over HDMI. The Nexus Q is already up for pre-order at a price of $299 and will ship mid July. I love the fact that this has a local cache however, as that has seemed like a no-brainer to me for years. Why stream in "real-time" with a wimpy buffer and unreliable WiFi ... if the bandwidth is available, get the whole thing downloaded ASAP. While some people are locked into the iTunes ecosystem, many of us are not. Notably, about ~51% of the smartphone market. While I have little use for a $300 music and video player without DLNA support, I would happily have paid $150 for this if it had DLNA support (with full mkv playback) and support for competing services like Netflix and Amazon Prime videos. Yeah, it is a little pricey, but it's made in the USA, that's huge in my opinion. Who says Google is going to fold the project and can a bunch of workers? That's an insane assumption. They have enough capital to keep it going long enough to improve it's marketability and usefulness with user feedback. Also, netflix, hulu plus, etc, are all available on TVs now. I think that Google knows this and is marketing this device to play back other content. It looks like the focus is on multiple device connectivity and ease of compatibility within the android ecosystem. Who needs yet another device that can play back netflix?